The Vortex Venom Red Dot may be used with almost any pistol, rifle or shotgun. Despite being small in size, this daylight-bright Red Dot is very precise, allowing for a rapid acquisition of the target in no time. The hunting accessory features scratch-free lenses that have an anti-reflective coating. The coating used in the device is a full multi-coating type of surface, which allows the MOA to deliver high-quality images. The device is also a preferred model because of its comparatively wider field of view. The exterior part of the Venom Red Dot is built using an aluminum chassis. This rugged outer chassis enhances the durability of the equipment, regardless of the environment, the device is used in. The intensity and power controls for the equipment are also conveniently positioned, making it easy to use. Throughout this Vortex Venom Red Dot review, you will understand why this is a must-have piece of hunting equipment. The Red Dots are preferred hunting accessories because of their versatility. Additionally, their devices allow for easy targeting—, especially for the long range hunters. As such, you can easily target your prey from a long distance, up to 100 meters, using these devices. The newest of the red dots—the Venom Red Dot–promises to be even better. For one, this happens to be a firearms-grade piece of equipment. Additionally, it is compact enough to fit on the sides of various firearms. Despite its small size, the Venom Red Dot offers a remarkable field of view as well as impressive image clarity. One of the things that you will love about this piece of equipment is its packaging and accessories. 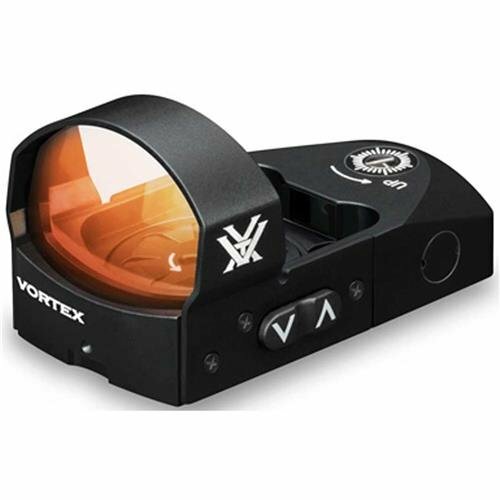 Vortex Optics is renowned for offering generous add-ons with their products. The Venom red dot is not an exception, in this regard. In addition to the optic device, the packaging includes an assortment of helpful accessories. Some of the accessories contained in this packaging include a slick picatinny mount as well as the required hardware to secure the red dot to the mount, spare screw, a piece of cloth for cleaning the lens a torx wrench, double-ended screwdriver, battery, and manual. The double-ended screwdriver features large and small flat heads, which may be used to open and close the battery compartment of the device. You may also use the screwdriver to make sighting adjustments on your equipment. The torx wrench, on the other hand, may be used to secure the device to the mount. Additionally, you will also find a soft rubber cover for the optic within the packaging. This soft rubber is for protecting the device and conserving battery power when the device is not being used. Vortex Venom Red Dot has a rugged, shockproof exterior body. As such, the device is capable of withstanding firearm recoil force and impact. This piece of equipment is also lightweight, an aspect that may be attributed to its single-piece chassis. The compact optic features O-ring seals, which make the device waterproof. As such, it is impossible for dust, debris, and even moisture to penetrate into the device. This not only makes the device reliable, but also very durable. This being the case, you can use the optic in virtually any hunting environment without worrying about the device being damaged by dust, moisture, and debris. Again, it also features a hard, low-glare, anodized mantle finish—which enhances its durability. The exterior lenses on the device are protected from damage and scratches by the ultra-hard, ArmorTek coating technology by the manufacturer. Just like the other dots by this manufacturer, the Venom Red Dot is very convenient to use in an array of hunting conditions. The convenience associated with this device is as a result of the various convenience features it offers. For instance, the unlimited eye relief feature provided by the dot allows for rapid target acquisition using the device. The extended battery life offered by the equipment also makes it more convenient. The auto-shutdown feature helps to maximize battery life, allowing the device to run for up to 30,000 hours—with the lower battery settings. For the highest battery configuration, the device can operate for up to 150 hours. Through the Venom Red Dot, Vortex Optics filled the gap between the high quality, expensive optics, and the cheap low-quality optics. At an affordable price, hunters can now have a high-quality optic with an array of superior features. If you are searching for a durable, reliable and affordable optic that will give you accurate targeting and high-quality images, the Vortex Venom Red Dot is the perfect option.